On roadways where there are safety and speeding problems, and vehicle lane widths are greater than the recommended minimums, narrowing lane widths (i.e. 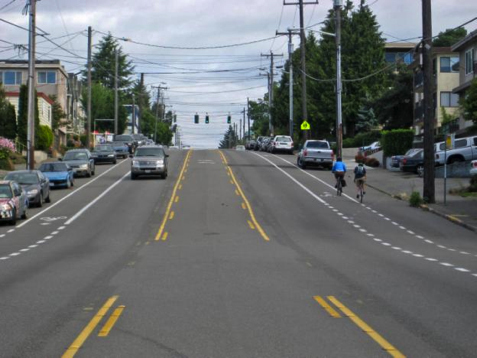 lane diet), can help improve safety and comfort for pedestrians, bicyclists, transit riders, and motor vehicles. Lane diets provide multiple benefits, including lowering vehicle speeds, reducing crossing widths and pedestrian exposure to motor vehicle traffic, and redistributing roadway space for other users (e.g., create space for bike lanes). •	Road narrowing projects should always consider the surrounding land uses, parking turnover, vehicular speeds, and the volumes and types of traffic (including pedestrians, bicyclists, transit, commercial, emergency response, and heavy vehicles). •	Evaluate whether narrowing may encourage traffic to divert to local neighborhood streets. •	On roadways with excess vehicle capacity, a reduction in the number of travel lanes may be feasible (see Lane Reduction). Simply adding striped shoulders or on-street bike lanes can cost as little as .15-.20 per linear foot, or approximately $750 to $1000 per mile. Restriping can cost between $5,000 and $30,000 per mile, depending on how many lanes must be removed, and whether bike lanes are added. 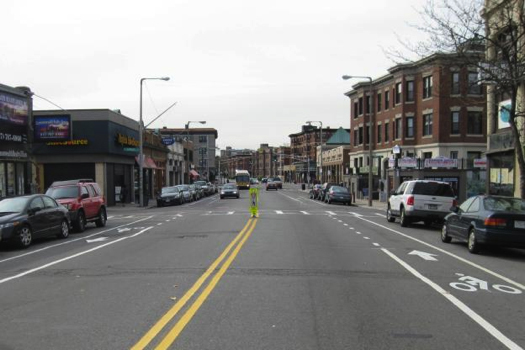 Typically the number of striping needed for a block puts the cost between $1,000 and $3,000 per block. If the road must be restriped or reconfigured, the cost is closer to $12,500 per block. Adding a raised median, widening a sidewalk, and adding improvements such as landscaping or curb extensions can significantly increase the cost.